Puppy Behavior - Confused? Don't Be! 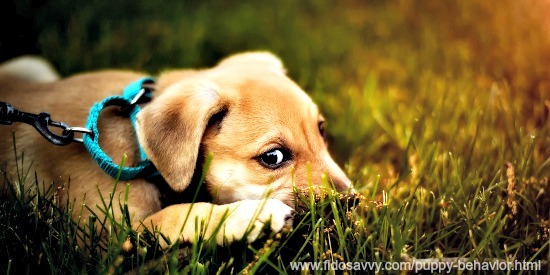 Puppy behavior is often irresistibly cute... at other times it can be frustrating, confusing or even downright worrying. Cute as they are, puppies aren't perfect (well, who is?) and every new owner has times when they wonder what on earth is going on in their pets' head... and whether or not it's normal! Sometimes you don't need to do anything except love the little furball. At other times you need to correct his behavior in a way he'll understand, or get some professional help from a dog trainer or veterinarian. Those tiny little play barks, wobbly legs and general puppy clumsiness, a 'shadow' that follows you everywhere.... this is all normal puppy behavior, and who doesn't love all that? But not ALL their 'little ways' are adorable. ..... (and many more) are pretty much an accepted part of puppy parenting. Of course, most of these are perfectly normal too, but they're still definitely less than cute! Growing puppies go through the teenage stage, just the way growing humans do.... and it can be equally as challenging for their parents. 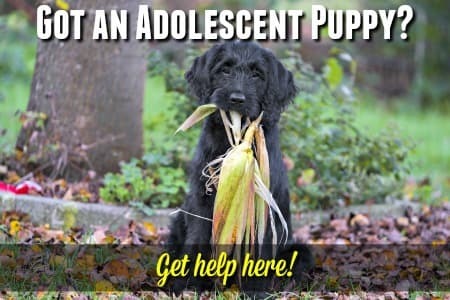 Check out the survival guide to Adolescent Puppy Behavior and you'll find the whole teenage thing a lot easier to handle! On this page you'll learn all about what's generally considered to be normal puppy behavior, and what's not - plus how to know when you need help. This way you'll get to enjoy the short-lived days of puppy-hood more... and worry less. That's got to be a good thing! Normal Puppy Behavior - What Does It Look Like? Although we love our puppies like children, they're not children - they're baby dogs, and dogs do things that their human family members often don't understand! What's normal for a puppy and works perfectly well within his canine family, often isn't such a good fit once he's in his new forever home. So, just because a certain puppy behavior is 'normal' in the canine world, that doesn't mean it's okay or that you shouldn't discourage it. During your pup's first few days in his new home, his behavior will be quite different to what you may have seen before, or will see afterwards. Why? Because he's a tiny baby and leaving his momma and siblings to live in a strange house that's full of new people, pets, smells, sounds etc. is very scary and traumatic for him. You can learn all about what to expect during these early days here on my Bringing Home A New Puppy page. It's also natural for a pup to be a little anxious and scared, especially at first, but there are things you can do to help him feel more confident, check out my Helping A Scared Puppy page for lots of easy tips and advice on this. Also, you may want to learn more about the 'Puppy Crazies' (aka the 'Zoomies') as this normal, but confusing, puppy behavior often has new puppy parents scratching their heads. There are a huge number of different dog breeds, and a potentially infinite combination of mix breed options. Each individual dog breed was designed with a specific purpose in mind and has it's own set of strengths and weaknesses... and behaviors. The more you know about your puppy's heritage the easier it will be for you to understand his behavior and figure out how to reshape it in a way that will keep you both happy. With little puppies, their behavior is purely instinctive and it's motivated by their basic needs, which include sleep, food, water, attention and elimination. Your new pup is like a little sponge who is just waiting to soak up all that you have to teach him. He doesn't understand why he shouldn't 'potty' in the house or why you get upset when he uses your dining room table as a chew toy. So, it's up to you to teach him how to fit in with his new family and what the 'house rules' are. Puppies are creatures of habit, they love routine and learn best through experiencing 'cause-and-effect' in a consistent way. This means that once you choose a way to correct a certain behavior that you need to stick with it.. and so does everyone else in your family. Your puppy will get confused if there is inconsistency in the way he's disciplined or if mommy says 'no' and daddy says 'yes'! Also, puppies have very short attention spans. They need plenty of time to learn new habits (and to forget old ones), so don't expect overnight success with any behavior issues. It can weeks, of constant, consistent corrections for your little guy to learn what you expect and to obey instinctively. 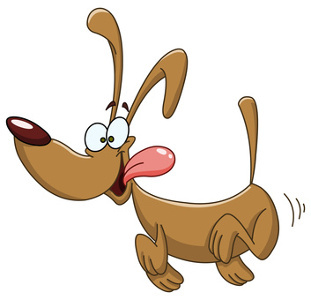 Barking is normal - it's how dogs communicate. 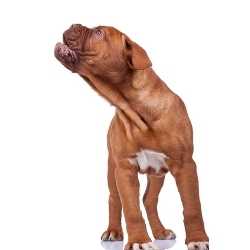 When your puppy barks it's most often to get your attention, because he wants to tell you something. Sadly, since we humans don't speak 'dog', it sometimes takes a while for us to get the message and even then something is often lost in translation! Perhaps your little one is bored or hungry, maybe he needs to go 'potty' or hears a stranger at the front door. Does he always get loud when he's been inside or in his crate for too long? Then perhaps an extra walk and a bit more playtime is the answer. Do you feed him at the same times every day, or is it a bit 'hit and miss'? Then perhaps his little tummy is grumbling. A bit of barking is normal puppy behavior, but excessive barking is not. Your puppy will probably bark, whine and howl when left alone in his crate to begin with. That's normal, and if you ignore it he will soon learn that he can survive for short periods alone and that you always come back. However, if your puppy becomes totally hysterical when separated from you, or he doesn't improve and adjust to short periods alone within a few weeks, then it could be a sign of puppy separation anxiety. 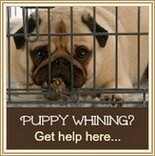 Excessive barking, or barking for no apparent reason, definitely needs to be discouraged. In that sort of situation you need to find out why he's making such a fuss and treat the cause in order to cure the symptom! For older dogs who are stubborn about nuisance or excessive barking, a no bark collar can really help. You can choose from tonal, impulse or citronella spray correction designs so that there's one to suit every individual dog. To find out more, and see the most popular models on our Petsafe dog training collars page. New owners seem to constantly be surprised by how often, and how actively, young puppies use their teeth! But when you realize that nipping, biting and growling are the main forms of communication between puppies in a litter it doesn't seem so surprising. ALL puppies bite/nip/mouth when they're young, but some breeds and personality-types are more prone to it than others. The word 'biting' can be a bit misleading because young puppies rarely bite aggressively, intentionally or with the intent to cause pain. Nipping or 'mouthing' is more accurate. Of course those tiny little puppy teeth hurt, and hurt more than you might think, but they are not being used with that aim in mind and a puppy who's nipping like this is NOT being aggressive or 'bad'... he's simply following his instincts. Although it's very common, this puppy behaviour needs to be stopped while your puppy is still young (and small). A 10lb puppy nipping playfully at your hand hurts but it's not serious, but if that puppy is still doing it when she weighs 50lb it's a whole different ball game! 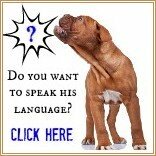 You can learn all about why puppies bite and how to discourage it in a way that little Fido will understand on my Puppy Biting page. When it comes to problem puppy behavior, this is a 'biggie'! But just as all puppies bite, all puppies chew! Some breeds tend to go at it with a bit more intensity and persistence than others and these are often the breeds that use their mouths for the work they were designed to do. As with nipping, this includes herding breeds and terriers and also gun or hunting dogs such as Retrievers. Chewing is a basic need for your puppy, he doesn't know why he needs to do it - he just knows that he does! This is especially true during the puppy teething stage, when he absolutely HAS to get his mouth on everything. It actually strengthens his jaws, helps to keep tartar and plaque from building up on his teeth, minimizes the pain of teething and is a great stress reliever - but this is news to your pup. Because chewing is a puppy behavior that is necessary to her health, your aim isn't to stop her chewing (that would be impossible) but to teach her what she's allowed to chew on and what's off limits. All the help you need to keep your pup's teeth busy while saving your home and possessions from destruction are on my Puppy Chewing page. It's much easier, and quicker, to potty train a puppy if you have a step-by-step guide to follow. And when you understand how your puppy's little brain works and how he learns. Dogs are den animals and their inborn instincts are to keep their den clean, so normal puppy behavior means that your little guy will try not to eliminate where he sleeps. 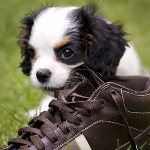 Crate training a puppy is the quickest and simplest method of housebreaking....it works WITH your puppy's natural inclinations rather than against them. Obviously your home is much bigger than a crate, so you need to help your puppy to understand that your home is his den and that it's not OK to 'potty' indoors. This can take several weeks of dedicated supervision and training... but it's totally worth the time and effort! Once your pup gets into the habit of eliminating outdoors and his bladder/bowel control life will become much easier for everyone. Housebreaking problems are often given as a reason for a pup or dog being surrendered to a shelter or pound.... very sad, and totally avoidable. And then there's submissive urination which is NOT a housebreaking issue but a behavioral one. This isn't something your little one has any control over, and if he wees when he's scared, getting mad at him is only going to make matters worse. Luckily, there are ways to handle this anxiety related puppy behavior, check out my Dog Submissive Urination page to learn more. I get many questions about 'coprophagia'... more commonly known as poop-eating! Disgusting as it sounds,many puppies eat their own stools from time to time, it's a habit started when they are still with their siblings and occasionally a dog will continue this into adulthood. You can learn everything you need to know about this puppy behavior on my "Why does my puppy eat poop?" page. Guarding food, toys, treats and so on is another normal puppy behavior. After all, little Fido could have had between 4 and 8 brothers and sisters, so it's understandable that he may feel the need to fight to keep 'his' stuff. But although this behavior is understandable it can be dangerous and needs to be dealt with while your pup is still small and eager to please. The desire to guard or protect 'his' people and property is going to come naturally to your puppy as well and regular socialization and training will make sure your little guy learns only the appropriate behavior. Teaching your puppy to give up anything he's playing with or holding, on command, is vitally important. Once Fido learns to do this, it is SO much easier to eliminate resource guarding behavior. It also helps if he decides to pick up road-kill on his morning walk, or decides a toad looks tasty! Learn how to teach the Leave It! Command Here. Guarding food and possessions however, is just as common in young puppies as in older pups or adult dogs. Dogs (even puppies) often realize that the adults in the home are in charge and in their minds children are their siblings and equal in status. That's why a puppy or dog may be fine with adults, but 'bossy' or dominant around a child. Very (VERY) few puppies are truly aggressive, so don't panic or think the worst if your little guy is 'nippy' or 'bossy'! It's important to make sure that your puppy realizes that every human (regardless of age/size) is higher up in the pecking order than he is, be sure to involve your kids in feeding, playing and training sessions. Dogs respect those who are in charge of the resources of life, and food is a biggie, so having your children share responsibility for feeding, training etc. will reinforce their superior position. As well as teaching basic dog training commands and manners at home, taking your puppy to training classes will help him to learn to respect, trust and obey you instinctively. 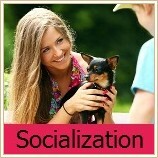 It will strengthen the bond between you and help you to learn to handle any puppy behavior problems that arise. Find out what types of 'aggressive' behavior worries other puppy owners, and see my suggestions for handling them, HERE. 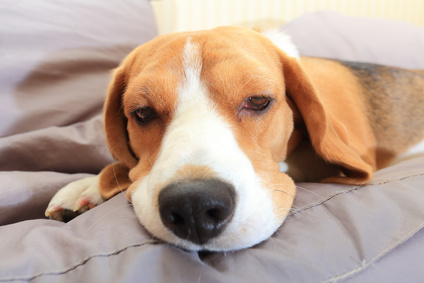 If your puppy or dog gets hysterical when you go out and leave him at home, or even when he's simply in another room where he can't see you, he might be suffering from something called canine separation anxiety. It can be difficult to be sure whether your pup is actually suffering from true anxiety or is simply nervous or unsettled when you're not around. Almost all puppies whine, cry and/or bark when left alone even for short periods and this puppy behavior is absolutely normal (and is an inborn safety mechanism which keeps them safe in the wild). As your little guy grows older and more self-confident this clinginess will disappear. 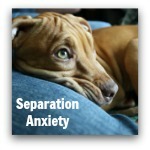 For more on this, visit my page on Separation Anxiety In Puppies. There's one aspect of puppy behavior that I get asked about a lot... and that's the crazy-hyper behavior that puppies often show towards the end of the day. Trust me, you'll know it if you see it! 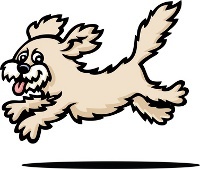 The Crazies/Zoomies usually involve Fido running in circles around a room, or through the whole house - and not just once, he'll do it over and over again. Often this running is accompanied by some barking and can include jumping at, or nipping at, people or other pets in the home. New puppy owners are often totally taken aback by this and wonder what on earth is wrong with their pup - the answer is 'nothing'! Many, many puppies act this way. It's basically a developmental phase. Young puppies get over-tired and over-stimulated easily, and their immature nervous systems don't know how to deal with this overload. So, what happens is your pup gets wound up tighter and tighter during the day... and then sometime in the late afternoon/early evening (usually somewhere between 4pm and 8pm) he hits 'overwound'. For a pup who is just running around, maybe with the occasional bark/yap, it's not too big a deal, he'll work off some steam and then usually go and take a rest. But often a pup is so over-excited that he starts barking, and jumping on furniture, or on people and nipping at hands, feet, pants, other pets and so on. This is a big 'no-no', and if Fido behaves this way then you need to step in. 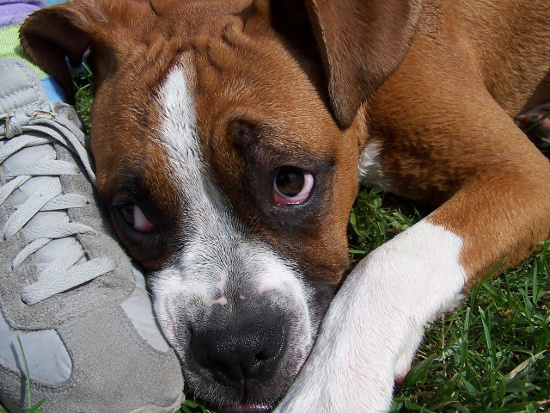 How your pup reacts to your intervention will depend a lot on his individual personality. Sometimes a verbal correction, something like 'No Fido! Go slow' and a redirection of his attention/energy to a more constructive (and quieter) game or activity can reset his zoomie-switch. But if your puppy is way too excited to listen and won't calm down, then you need to give him a 10 - 15 minute 'time out' (basically just some 'quiet time') either in his crate, or in a separate room. Because puppies and dogs use chewing as a major stress-reliever (this is one of the reasons why dogs chew up everything in sight if they're left at home and anxious), it's very important to make sure that your pup has some safe, sturdy chew toys to play with during his quiet time. Playing low calming music for him while he's in 'time-out'. Classical or 'elevator-type' music is good. Or there are relaxation CD's made specifically for dogs which are great. Using a pheromone collar (worn continuously) and/or a pheromone diffuser in his time out room. This is a totally safe & natural way to reduce your puppys' anxiety levels. Making sure that Fido gets plenty of exercise (both physical and mental) as well as enough naps during the day. Once you understand what's causing your little guys nutty behavior it's easier to handle it calmly and consistently, which makes it less of a problem. 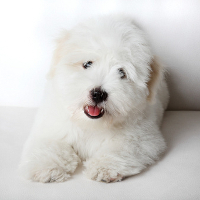 The way your puppy behaves can also tell you when something is wrong or he's not feeling well. YOU know your puppy better than anyone else, so it's easier for you to tell when he's 'just not himself' and it's important to always trust your instincts on this. If you're in doubt always make sure you get your little guy to your veterinarian for a check up. 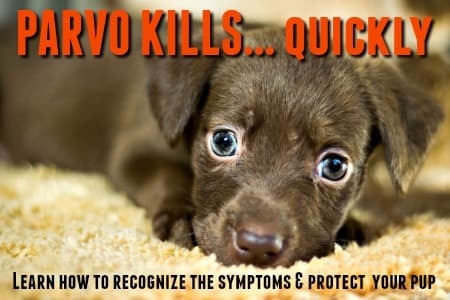 There are lots of other symptoms that a sick puppy might exhibit, but these puppy behavior changes can also be an early-warning system that it's worth paying attention to.